When Jaymi and I were first exploring the idea of starting a blog, we did our research. Not about the “important stuff” like Pinterest strategies and Search Engine Optimization, but stuff like what colors we liked, what topics we could cover and what vibe we wanted. During this phase I came across a cautionary tale about a woman that blamed her divorce on her devotion to her blog. I paused, re-read it, and sent it to Jaymi. We decided then and there that priorities included staying friends, maintaining a strong marriage, and enjoying this gig. 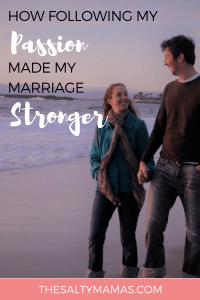 Even with all our new goals and dreams, I never once imagined that the blog could make me a better friend, a better Mother, and help me build an even stronger marriage. Fast forward to almost a year later. I found myself in a little spat with my husband. He was working long hours, we were both chronically exhausted and we both felt our partner was spending too much time on other things, and we were neglecting each other. At one point during this exchange he brought up the idea that once he gets home from work, we should both put away our phones and laptops. He proceeded to take it one step farther saying I probably shouldn’t be on my phone in front of the kids either. I gently tried to remind him that my entire life is spent with the children, or during the evening when they’re in bed, which was now also to be screen free. He stood firm, saying he thinks it’s best. I took a breath, thought about my next move, and declared I would have to quit the blog. I’d be messaging Jaymi immediately – pending “approval” to use my phone during quality time hours. I would be essentially tendering my resignation as a Salty Mama. He sighed, said that’s not what he meant, but that I probably should think about how much time I was putting into this. I was livid. Devastated. I was beyond words. I couldn’t understand how he couldn’t see that this wasn’t about a blog. It was about me having meaning in my life that went beyond the title “Mom.” I swallowed all my thoughts and feelings that I knew I wasn’t ready to express in a rational manner and let it go for the night. When I woke up, I worked even harder on the blog. I wrote, I edited, I crafted pins, I researched strategies to increase our reach, but I never complained and I stuck to the deal that I would not work on it after he got home from work. I found myself sitting on the couch late at night after he’d fallen asleep. I’d wake at 4am with an idea and have to go write immediately. We had successes with readership, sponsorships, pins getting repined and I started sharing those successes with him. I tried to explain our analytics and Pinterest strategies and he tried to follow along. It started to seem like the conversation we had that night had never even happened. About a week ago I was on a date night with my husband. As we sat enjoying craft cocktails and bruschetta, sitting in a swanky bar, dressed up to go to the theater and acting adult AF, he brought it up. But more amazingly, he offered an apology. He said he was sorry for ever suggesting that I pull back on the blog and he’s glad that I was so stubborn that I dug in deeper in response to him. He continued by saying that he had seen a change in me. A spark that I had lost over the last few years of being covered in spit-up had come back. He was proud of me, impressed by my tenacity, and thought it was hot. I didn’t realize until that moment how much I needed to hear all those things. Being a stay at home Mom had wiped me of some of my passion. Blogging brought it back. So I don’t say any of this to talk about blogging, not really. It’s about following whatever that is for you. About offering a counter narrative to the article I read. It’s for Moms that are afraid that doing what makes them happy is going to ruin their marriage or their family. Whether you work from home or blog or sell bags or make something and sell it on Etsy or are writing a novel – you can take that passion and let it reignite your love life with your partner. It can make you a more complete person. It can rejuvenate you when you’re making another freaking sandwich for a school lunch. So find that thing. And let it make your family stronger. Your marriage stronger. Make YOU stronger. It may not always be easy, but in the end, you’ll always be glad you did it.